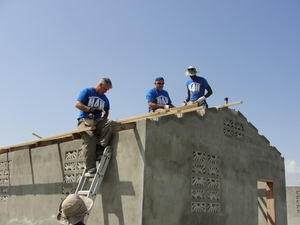 After the January 2010 earthquake, One Mission Society quickly began funding and building homes to help people in our OMS-related churches in southern Haiti. We were blessed to build 54 homes for people who already owned property. Now, we are working on building a community of 35 homes in Bon Repos for the poorest of the poor families. This project includes building 35 houses, a church/school, water wells, and a playground for church families who do not have, and cannot afford, property to build on. This is where we need your help. Perhaps you have heard of the success of the recent ALS ice bucket challenge, which raised more than $60 million. Well, OMS has developed the Haiti Block Challenge to raise awareness, prayer support, and money for new homes being built for earthquake victims in Haiti, and/r to encourage people to participate on a short-term mission trip to Haiti. Help us generate some buzz for a great cause. We challenge YOU to take the OMS Haiti Block Challenge and encourage you to now challenge your friends to participate as well. Take the challenge by donating $12 (or more) per block to help build a home in Haiti or participate on a short-term trip to build a home with an OMS work team … or both! Creatively show the number of blocks you are personally sponsoring in your video. You can use bricks, blocks, cardboard boxes, or Legos … however you want to creatively show your donation. 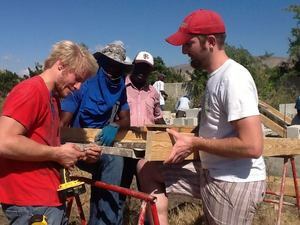 Like us on Facebook and then tag OMS in any Haiti Block Challenge video you create and use #HaitiBlockChallenge. In the coming days, we will be posting some challenges. Challenge at least 3 friends by name to take the OMS Haiti Block Challenge. If you want the video script in its entirety (the first paragraph above is a portion of the script), please email: info@onemissionsociety.org and put OMS HBC video script in the subject line. Click here to donate directly to the challenge and read more details about how the money will be used. You can also send a donation to One Mission Society *PO Box 1648 * Monument, CO 80132-1648 for project #408063-14G910. For more information on participating on a Homes for Haiti work trip to Haiti, check out these opportunities, or contact Bill Evans at bevans@onemissionsociety.org. Read an inspiring story of how Hannah, one little girl, raised enough money to build two homes.